Your business card is often the first--and sometimes the only--impression that people get of your company. Thus, you should shop around for the perfect business card design--or design your own, if necessary. Your business card should be simple, yet memorable, and have all of your contact information--name, phone number, fax number, email address, website address, and social media details. Avery, the office-products company, has hundreds of free, downloadable Microsoft Word-compatible business card templates. Most of the templates are pretty generic, but you can manipulate them in Word. Avery's templates are best if you're extremely comfortable with Word and have an idea of what you want. HP has two different design sites: Creative Studio, which features downloadable, customizable templates, and Marketsplash, which features an online tool for designing your materials. Between the two sites, HP has a few hundred attractive business card templates to browse through, and all are free. Online printing company Vistaprint is known for its business cards, and offers a variety of services to suit every customer, starting at just $9. Vistaprint lets you choose a premade template, build your own design on its Website, or upload your own custom design for printing. Vistaprint also offers free business cards, though these are limited to 45 templates and have Vistaprint branding on the back. Another online printing company, Moo Prints, is a bit pricier than Vistaprint (starting at about $20) but offers better quality. Moo Prints has about 230 modern-looking business card designs to choose from, or you can upload your own image. It even integrates with Flickr, so you can print cards that each feature a different picture from your own online photo gallery. Moo Prints templates are the most attractive, in my opinion, but also pretty expensive. If you'd rather work on desktop software to design your card, NCH Software's CardWorks (free) and Biz Card Software's Business Card Designer ($30) each offer a number of predesigned templates. Both programs also let you upload your own logo to their designs, design your card from scratch, and print the cards from your own printer. 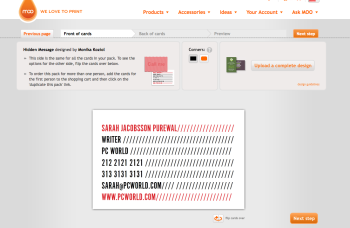 Designing a "Hidden Message" business card on Moo.com. Once you've finalized a business card design, you'll need to print them. You can either print cards from home or outsource to an online or local print shop. However, with Vistaprint's dirt-cheap printing services, I'm not sure why you'd want to print at home--unless you just enjoy do-it-yourself projects. If you do print business cards at the office or at home, you'll need special card stock with perforated edges (don't worry, the edges won't be noticeable, though I do recommend using a paper cutter). Avery sells such stock for both inkjet printers ($12 for 250 cards) and laser printers ($19 for 500). Be sure to line up your paper correctly and print a test sheet before printing out several thousand. If you choose instead to outsource printing, Vistaprint is one of the cheapest services. It starts at just $9 for 250 cards--matte finish, one-sided, custom design. Additional services include glossy finish (an extra $6.50), 100-pound premium matte paper (+$6.50), dual-sided (+$3.50 for black and white, +$6.50 for color), and foil accent (+$7.50). Moo is a bit pricier, starting at $70 for 200 cards. Moo's price isn't unwarranted, however--all cards are dual-sided, printed on matte laminate card stock, and in full color. Moo's basic service also includes "Printfinity," a service that lets you print up to 50 different designs in one pack of cards.